Can you imagine using a jeweler’s eyepiece and tweezers to pull the male organs off a grapevine? Randall Grahm can. It’s a patient task, but he’s doing it because he’s impatient. 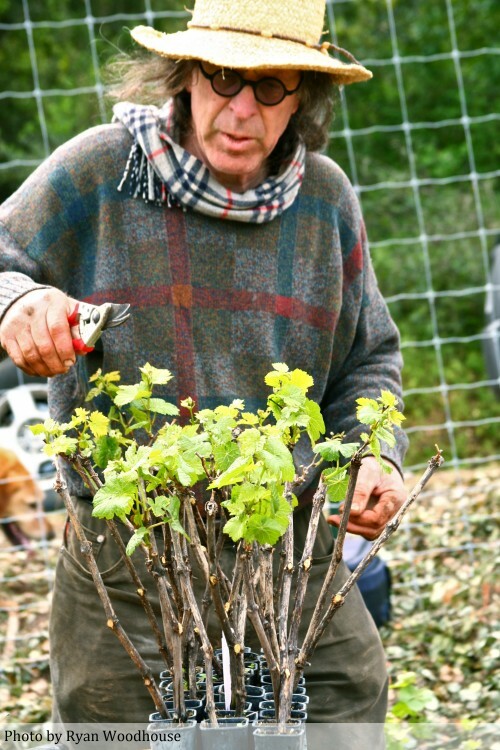 Despite his fame and success in the wine industry, Grahm has not had control of his grapes for most of his career, since the loss of his vineyard to Pierce’s Disease in 1994. A recent 25-year retrospective tasting of his flagship Le Cigare Volant brought that point home. His very first wines in the 1980s, made mainly from grapes from some old grenache vines he found near Gilroy, were the best. 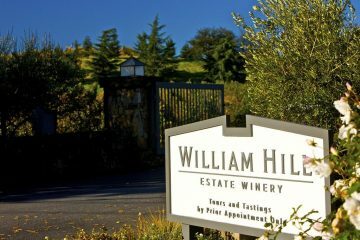 As he expanded production to meet demand in the mid ’90s, he lost access to some good vineyards, had to buy from others that weren’t up to snuff, and the quality went downhill for a few years. 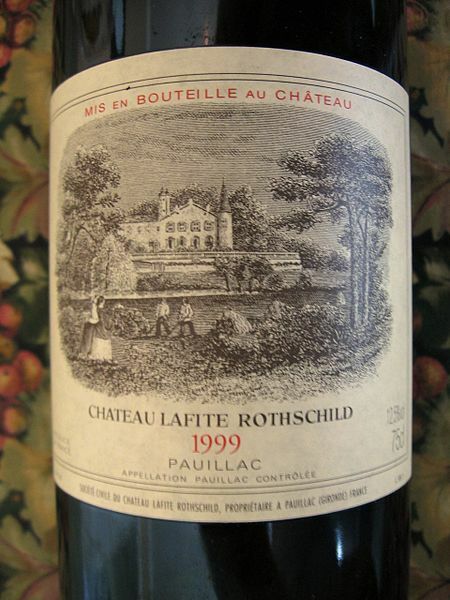 It has rebounded, but still hasn’t reached the heights of the first few vintages. “I seemed to forget, at least for a while, the most important winemaking lesson: one must begin with exemplary grapes,” Grahm says. Grahm finally bought a new vineyard in San Juan Bautista last year. But a new vineyard takes at least four years to produce any crop at all, and could take decades before it produces the kind of complex, site-specific wine Grahm wants to make. Hence the vine neutering, which Grahm wouldn’t actually do himself. “This is why God created interns,” he said. The theory is this: Grahm will plant a special castrati-to-be group of Rhône varieties, including grenache, mourvedre, cinsaut, syrah, and possibly others that he believes are suited to his new vineyard. “The vines already have an affinity for each other,” Grahm said, because they are frequently grown together in the Rhône valley, and their fruit is often blended. 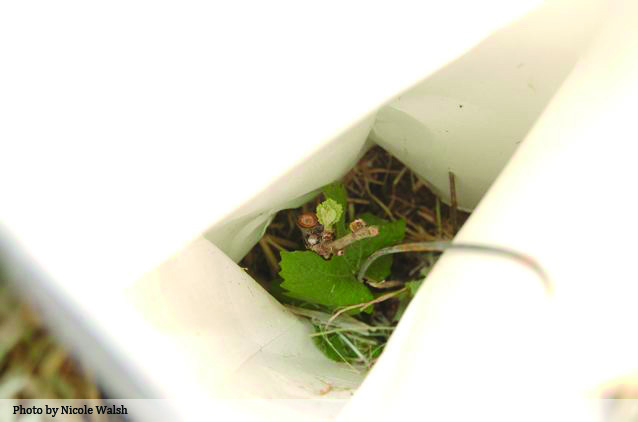 Then vineyard workers will rip their stamens off and enclose the vines in plastic bags. They will also collect pollen from other, non-emasculated vines and throw it in the bags. These vines will thus be pollinated by other vine types and produce seeds. Grahm (or his God-sent interns) will plant the seeds. Just as with humans, every grapevine grown from seeds is unique, with half the DNA from each parent. If a syrah vine fertilizes another syrah vine, you get syrah—a new clone perhaps, but syrah just the same. But if a pinot noir vine fertilizes a cinsaut vine, then you might get pinotage, which is exactly what happened in South Africa in the 1920s. And that’s a mixed blessing: pinotage grows well in South Africa, but the wine made from it often smells like burnt rubber. This is completely unlike the way wine grapevines are normally grown, because few grape growers want to leave their future to chance. Instead, they physically graft a desirable clone onto an existing root, cutting into it and tying the small bud and the larger root together. In this way, most vineyards have acres of the same clone of the same grape. It’s monoculture, but it’s predictable, which is a virtue if you have loans to pay off. Grahm is not the only Californian trying to grow unique grapevines from seeds: Sashi Moorman is growing 8,000 pinot noir vines from seeds in Santa Barbara County. 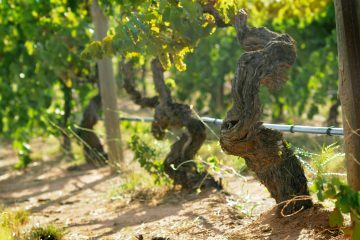 It’s also important to note that Grahm’s new vines will grow their own roots into the soil, rather than being grafted onto roots chosen for resistance to the worst scourge of the wine industry, the vine-killing root louse phylloxera. This pest nearly wiped out every vineyard in France in the 1800s, and is still a threat that must be considered by almost every grape grower in the world. On the positive side, Grahm could create the next cabernet sauvignon, which was a love child that naturally occurred in French vineyards between cabernet franc and sauvignon blanc. The problem is, he might not know it. Under his plan, he’ll plant all the seeds that result from his project—remember, they’re all different. He plans to combine the fruit from them into one field blend, which could be one of the world’s most interesting wines, undrinkable swill, or anything in between. I asked Grahm if it felt like playing God, and it was the only question he fielded over the course of a 6-course, 7-hour, 30-wine dinner that he seemed taken aback by. In fact, Grahm is letting randomness choose. If you want a stark visual image, it’s what vineyards in the Rhône Valley might become a few hundred years after mankind is gone. But in that case, we would never be able to taste the wine. Grahm hopes to have some samples to drink within this decade, God and interns willing. Very Cool! I’ve always thought that winemakers might be limiting themselves by using clonal varieties, but I guess that grants consistency and predictability. Here’s to hoping for the next great clonal variety to sweep the world…gremourvesautrah. A few thoughts. Mr. Grahm must have done research into the clones he’s initially selected. There is no ‘Syrah’ as such; there are Syrah clones, etc. And DNA expression is not a 50/50 proposition. Additionally, there are thousands and thousands of red and white Vitis vinifera varieties in the world. Only a pitiful handful are known to consumers or even grown on significant commercial acreage. It is not clear to me why this already existing diversity is somehow an insufficiently deep pool of agricultural and natural history. To begin with well-known grape varieties, as Mr. Grahm seems to have settled upon, will not necessarily result in innovative grapes and flavors, and certainly will not necessarily result in terroir/vine ‘synchronicity’. Indeed, in light of the sheer number of varieties world-wide, many threatened with extinction, it surprises me that Mr. Grahm has not instead begun a kind of rescue mission of this genetic heritage itself, his vineyard becoming a kind of Noah’s Ark, rather than what appears to be the pursuit of diversity for its own sake. Why not a field blend of endangered varieties? Though I generally like his idea, I cannot help but think that Mr. Grahm’s experiment is a little like hunting squirrels with a shotgun. You’ll get the critter, but that does not make the hunter a good shot. Given the fact that so much of what we enjoy consuming today, both in the wine world and our foods, are the products of selection and hybridization, what Randall is doing is really a continuation of that process. In this case however, the goal is not a product that will provide some simple commerce enhancing feature like better shipping or shelf life, it’s trying to provide the opportunity for something absolutely new to flourish, and sublimely reflect its environment. With so many wine drinkers (in this country) cognizant of only a handful of varietals, one would think he might be moving against the tide. He may seem to be tilting at windmills, but my own brief encounter with him makes me think that his fascination with the many lesser known but fabulous Italian varietals, also gives him hope that something genuine will sprout at home. This kind of trial is not without precedent. I am personally grateful for the life-work of Elmer Swenson and his time at the University of Minnesota that has yielded hybrid varietals which allow me to make some wine at home from locally grown grapes here in VT. Wine in VT???!! What abberation is this, you might ask? Our 2009 Vignoles/NY 76 blend has a nose of bosc pear skin and white flowers that envelops your nose hairs at about 6 inches from the glass…and even though I feared the acidity from a tough growing year, I believe the spontaneous ML was fortuitous (the hybrids are a lot higher in malic than tartaric acid), and the remaining tartness is mouth watering and fresh, and the wine itself is more complex and mineral than I could have hoped for. Only four bottles of the 2008 La Crescent left and professional people still asking to taste it again. It’s a long term project that will be interesting, and it will certainly be fun to see what the DEWN list is sending in about six or seven years. Good luck to the interns. Fascinating stuff. Not sure I understand why some refer to this as FrankenWine; seems sensationalistic, when Grahm’s goals are rational and easily understood, if unconventional. It is a shame that great thinkers like Randall can’t live an extra hundred years to see the evolution of their ideas – to see those ideas bear fruit, if you’ll pardon the pun. I understand his urgency and I hope he has several wonderful decades to go, or perhaps even more. Thanks to Blake for this good accounting of future vineyard plans. The only slight cavil I might have is that I’m not sure he really represented the depth of true existential angst that I experience (pretty much on a daily basis) as far as ever creating a wine that is truly original and somehow deeply enriches our world – aesthetically and ecologically. In the New World, it is a very great long-shot to create something truly original for so many reasons – lack of genetic diversity in one’s planting material for one, but more importantly insufficient time to iterate and observe. I think that it may be somewhat presumptuous on my part to claim (or even imagine) that the methodology that I plan to pursue might be appropriate to create something like a vin de terroir in a single generation, but I think that at a minimum it creates some very fertile conditions for something interesting to occur. You are allowing small and great differences to appear in the vinescape and if you happen to have your wits about you, you might be able to land upon some useful algorithm for inclusion/exclusion that would create a truly complex and coherent blend. I don’t recall whether I had mentioned this at the dinner that Blake attended, but simply by growing a grape vine from seed, you create or can create a radically (nice pun, Randall) different rooting system, as compared to a grape vine grown from a vegetative cutting, exhibiting a much higher degree of geotropism than the one grown conventionally. If for no other reason that this, one might (and this is all theoretical) produce vines that are much more deeply rooting than conventional ones (maybe more drought tolerant? ), and perhaps even exhibiting some characteristics of older vines at a relatively tender age. This fact alone might end up being the most interesting aspect of the experiment. Of course, for reasons of practicality the seedling experiment will have to remain a relatively small part of the overall project of vines planted at San Juan. But if things go well, there will be an opportunity to see a real comparison between wines blended in the cellar and those made from vines blended on the genetic level in the field. Whether this is interesting to anyone else in the world beside myself I could not say, but it keeps me up at night in wanting to know the outcome. Whether the blend of this very heterogeneous assemblage will amount to anything startlingly beautiful and distinctive will also have to be seen (or more accurately, tasted), but at a minimum, it will bring the expression of more genetic diversity into the world and in an environmentally challenged planet, this cannot be such a bad thing. An interesting project. I wish Randall success on this. Technically speaking I believe this is incorrect. The cross pollination progeny of Syrah x Syrah is not Syrah, but a new grape variety. Syrah is only that which is asexually propagated from a pre-existing Syrah vine. I’m no scientist, but this goes against everything I’ve ever encountered on the subject. Vines do not grow from seed. Varietal persistence can only be achieved by taking a cutting from an existing vine. Even if you cross Syrah with Syrah, you will not get Syrah if you grow the resulting seed. As I understand it, each seed will be different as well. What’s more, scientists attempting to create new suitable varieties can spend entire careers without creating something anyone wants to grow, so good luck winning the genetic lottery Randall. From the Oxford Companion: Grapevines are highly heterozygous outcrossers and do not breed true from seed, which is the reason for their universal vegetative propagation. Blake — just a thank you for your reporting. This article, and the recent sustainability pieces, and even reaching back to your Coro Mendocino articles for the Chron, bring something positive to this “industry” — they bring a little magic back to wine. There are people out there trying hard, playing hard and thinking about what wine can be. 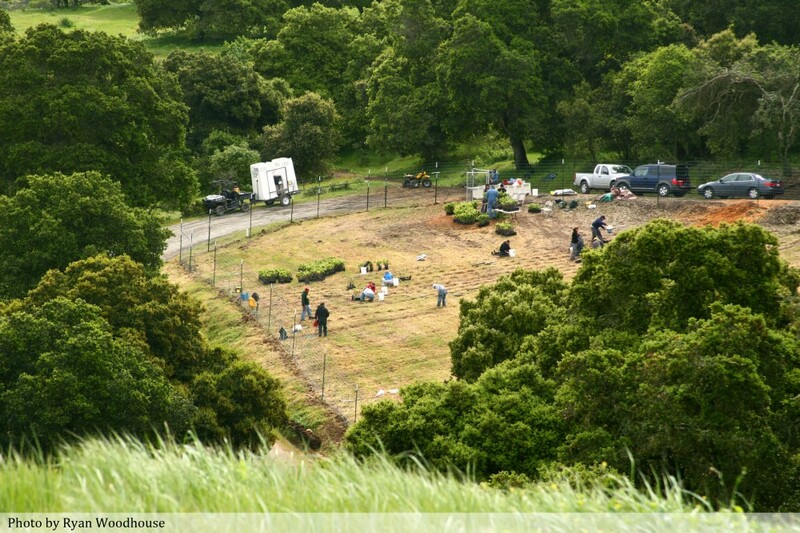 You’re out their digging and finding the folks that keep California wine honest and artful. Keep it up! Go Randall! Interested in Mr. Grahm’s experiment, I asked Dr. Ron Jackson about a limited number of its aspects. He wrote back a few minutes ago. “It is general knowledge that, in cultivars descended from out-crossing plants, selfed progeny do not possess the desirable qualities of the parent. Thus, grape cultivars are propagated vegetatively (via cutting), not sexually (by seed). The same applies to apples, peaches, etc. Consequently, the majority of grapevine crosses do not yield enologically or viticulturally valuable offspring. It can also take up to twenty or more years for the qualities (and failings) of a seedling to begin to be assessed. What can one really tell about the wine-making qualities of the limited number of grapes derived from a single vine (seed)? I have requested clarification from Dr. Jackson on a one point in particular. I’ll post it here should he reply. “There is a phenomenon in plant breeding termed compatibility. It is a term to describe (cover) our ignorance. From experience, some individuals consistently produce better offspring than others, for reasons regrettably unknown. A viticultural example might be the extensive involvement of Gouais blanc in the presumptive parentage of many French and several German cultivars. By itself, Gouais blanc is a variety of almost no enological importance. Thus, just because one crosses two apparently wonderful cultivars, there is no guarantee that any of the offspring will express the desirable traits of either, let alone both. The typical result is a “hodge podge” of attributes, typically of negative value. At best, one can only expect half of the traits of both parents to express in the offspring. Because some traits (gene allelic forms) do not seem to mesh well together, the results are typically disappointing. It is almost like gambling. Most of the time you lose, occasionally you draw equal, only rarely do you win (unless you are a professional gambler, know the odds, have a fantastic memory for what has occurred, are “cool” and never express visually any signs of what you have in hand, are lucky (what ever that means), and have a bankroll that permits one to lose extensively on occasion without panicking). Certainly, if the winemaker emasculates the flowers it will help. Nonetheless, he had better do it fairly early (before the pollen matures), and carefully (to avoid physically damaging the ovary). The flower self-pollinates very easily. The sole purpose of my intervention here was to highlight not only the inaccuracy of the initial article, but of Mr. Graham’s indulgent response. 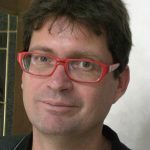 Sadly, by virtue of our surrender to the simple-minded brevity appropriate to fetishized social media, wine bloggers routinely give a pass to ‘experts’ and winemakers, allowing them to celebrate a wisdom they do not, in fact, possess. As bloggers, our only defense is knowledge. Get some. I am reasonably familiar with the theory and processes of grapebreeding (I’ve done some inter-specific hybridizing, as opposed to Mr. Grahm’s intra-specific crossing), and his prospects are reasonable, even if extremely long-term. However, I am intimately (and professionally) familiar with the history of vinifera and phylloxera, and I can state without the slightest doubt that exactly zero of his crosses will have any resistance to phylloxera. That particular genetic test has been done at least a billion times before, and all its results were failures. While some areas of California are not as hospitible to the bug as others, none is without suitability. Hence it is only a question of time before all his vines will die. Perhaps it will take long enough to kill them for him to evaluate their wine. But more likely not. Only American genes or American roots can protect against the bug, and neither of these seem to figure in Mr. Grahm’s plans. Too bad. It’s amazing! So many other people have spent their lives breeding grapes, and there is hoopla over this guy. Ignoring science is a bad idea. He is about to get a hard lesson in phylloxera. Another hard lesson, 99% of plant breeding, whether it is old bag and tag or GE, is failure! Most seedings do not live long enough to bear grapes. Some are staminate and will never bear. It is unusual to to get grapes that are superior to the parents. When you cross Syrah with Syrah, you do not neccessarily get another syrah!keep in mind that Syrah is a hybrid also. My advice is to make crosses with the local wild grapes.